Inglis is doubling down on the beliefs that cost him his seat in Congress: Climate change is real, and Republicans must act. CHARLESTON, S.C. — Eight years ago, Bob Inglis ran for a seventh term in the U.S. House of Representatives and didn’t even make it out of the Republican primary. He lost by nearly 3 to 1. His estrangement from South Carolina voters ran deep, friends-gone-missing and allies-turned-enemies deep. The chief reason Inglis was rejected by his constituents? He not only believed climate change was real but, as a solution, he proposed a tax on carbon. In a deeply conservative corner of one of the most conservative states in America, Republicans did not welcome those views. Such a “spectacular face plant,” as Inglis now calls it, would have sent many politicians scrambling for safe haven. A lobbying job is a standard refuge. So is a return to a previous life — in Inglis’ case, real estate law. Inglis, instead, has gone all in on the bet that cost him his seat in Congress. He runs his own nonprofit, RepublicEn, devoted to getting conservatives to come to grips with climate change. At the start of his second national tour recently, the committed Christian proselytized for a carbon tax, saying it would boost the green fuels of the future and spur prosperity. The first of his tour’s 14 stops came in late August in the South Carolina low country, where he grew up. One colleague would write that he “took Charleston...by storm.” Perhaps, but only if the storm was slow moving and unpredictable, the kind you might expect in a time of global warming. Older Republicans folded their arms skeptically over their chests and sighed, or even groaned, as they listened to a subject they said didn’t feel particularly pressing. A host on WTMA radio flubbed Inglis’ name — “Bob English! How are you, sir?” (His name is pronounced Ing-GLISS.) — and questioned humankind’s ability to do anything about climate change, before quickly moving on to more pressing business — giving away tickets to a RiverDogs minor league baseball game. Younger Republicans, though, sat up and took notice. At two colleges here, students mostly agreed that something had to be done to rein in spiraling greenhouse gas emissions. Many of the self-described conservatives said they were eager to learn more. That’s how it goes when you are talking to Republicans about climate change. A recent poll showed that just 31 percent of party members across the country accept what is an overwhelming scientific consensus — that global warming is caused by human activity. And surveys show the topic is not a top-five priority, even among Democrats. Why would anyone listen to climate change ruminations from a deposed congressman, eight years removed from office? With President Donald Trump’s administration expressing skepticism on global warming, and Democrats lacking the votes in Congress to advance legislation, some climate change activists believe their only hope is to convince Republicans to join the fight. And the best people to do that convincing may be other Republicans like Inglis. University of Connecticut researchers found this spring that Republicans — not Democrats or even climate scientists — were more effective in persuading doubters to give up their climate change skepticism. Republicans might be perceived as more believable on the issue, because they are willing to take a political risk, the authors said. A small but increasingly active group of conservative and libertarian organizations has seized this opportunity. Roughly a dozen national groups have rallied around proposals to fight global warming, including the conservative R Street think tank, free market-oriented Niskanen Center and the Evangelical Environmental Network. A blessing from the highest echelons of old-guard Republicanism comes from a triumvirate of former Republican Cabinet heavyweights: George Shultz, Howard Baker and Henry Paulson, who favor a carbon tax. Inglis has become one of the most oft-quoted members of this burgeoning “eco-right” since 2012, when he founded the Energy and Enterprise Institute at Virginia’s George Mason University and created its brand name, RepublicEn (the “En” stands for “energy” and “enterprise”). That has made him a bit of a celebrity, even among liberals. He won the 2015 John F. Kennedy Profile in Courage Award for bucking his party, and safe political ground, to advocate action on global warming. RepublicEn distributes an online newsletter and urges its reported 5,890 members to preach about climate change and the benefits that would come from putting a price on carbon. The group has a budget of about $1 million and a staff of six, with Inglis, the 6-foot-tall politician with the blinding-white smile, its singular public face. Inglis, who turns 59 in October, was born in South Carolina’s coastal lowlands. The son of an industrial engineer who helped manage a paper bag factory, he attended Duke University and the University of Virginia Law School, before launching a career in real estate law. In 1992, he upset a Democratic incumbent in the north end of his native state to win a seat in Congress and soon proved himself a conservative stalwart. He won a 100 percent rating from the Christian Coalition of America and an A from the NRA. As a member of the House Judiciary Committee in 1998, he voted to impeach President Bill Clinton. After promising in his first campaign to spend just three terms in the House, Inglis lost a 1998 bid for the U.S. Senate and returned to his private law practice, not running for office again until 2004, when he easily retook his seat in the House. To his constituents around Greenville and the Bible Belt that sweeps through the north end of the state, Inglis looked and sounded much like the Scripture-quoting representative who had left office six years earlier. Step one came when his son Robert, then 18 and the oldest of his five children, told him he looked forward to casting his first vote for his father. But first, he needed to “clean up his act” on the environment, his son told him. Not long after his return to the House came step two. Inglis joined a congressional delegation visiting Antarctica, where he watched researchers bore deep into the polar ice, extracting cores clearly marked by the carbon dioxide spike that began only with the Industrial Age. Finally, in 2008, he made his second visit to the Great Barrier Reef on another congressional trip. Inglis recalls the day as a revelation. The Australian oceanographer Scott Heron, the group’s guide, surfaced with unbridled joy, clutching the wonders of the world’s largest reef system. “He was preaching the Gospel,” Inglis said. “I could see it in his eyes, I could hear it in his voice. I could see it written all over his face — that he was worshiping God in what he was showing me.” Inglis was deeply moved, and simultaneously disturbed, to learn that spiking ocean temperatures were bleaching, and killing, the once rainbow-hued coral. All that he had seen and heard emboldened the small-government conservative, in 2009, to introduce the Raise Wages Cut Carbon Act. Inglis designed the bill to make polluting fossil fuels more expensive, with proceeds from the tax to be handed back to taxpayers in the form of payroll tax cuts. The bill, co-sponsored by Sen. Jeff Flake, R-Ariz., never got a hearing. "When you lose in your party primary, it’s like you have been kicked out of the nest." Far from beginning a renaissance for Republicans on global warming, the carbon proposal became exhibit one as fellow Republicans attacked Inglis in 2010. It didn’t help the incumbent that he had voted against President George W. Bush’s proposed troop surge in Iraq and in favor of the government bailout of banks that had collapsed in the Great Recession. Trey Gowdy, a tea party favorite and former Inglis friend, finished first in a five-person Republican primary, leaving the final outcome all but inevitable. The 71-percent-to21-percent loss left Inglis a virtual exile in his home state. At RepublicEn, Inglis has focused on reviving a proposal much like his failed carbon tax. The idea is to force the dirty fuels to compete based on their true cost to the environment and to people — taking into account the lower property values and higher health costs that come with living alongside billowing smokestacks, smog-choked freeways and flooding shorelines. The current version of the tax would charge $25 per ton of carbon dioxide emissions. That would add about 21 cents to a gallon of gas and $11 a month to the electricity bill for the average home, RepublicEn calculates. The higher prices theoretically would inspire some consumers to turn to greener fuels and inspire power companies to get electricity from clean sources like wind and solar. And the tax proceeds would be returned to the people, RepublicEn says, via tax cuts or a dividend, similar to the one Alaskans get for oil extracted in their state. Republicans may one day get behind legislation with the potential to remake energy markets, but not yet. In July, the House of Representatives approved a nonbinding measure saying that a carbon tax would be detrimental to the U.S. economy. That rebuke came as Rep. Carlos Curbelo, R-Fla., introduced a proposal similar to RepublicEn’s, with one notable change — a portion of the $57 billion or more a year that would be collected would be used to upgrade the nation’s aging infrastructure. The measure is seen by Congress watchers as standing little chance of passage. The RepublicEn team picked the low-lying Carolina coast as fertile turf to begin Inglis’ tour. It was close to his hometown of Bluffton and in a region that some scientists say will routinely flood by the middle of this century because of sea-level rise, fueled by global warming. At the first stop, at a Hilton Garden Inn in Mount Pleasant, a club was so busy with other business, Inglis got only five minutes. He had just begun — urging Republicans to lead on climate change — when he heard a low chuckle. Or was it a grunt? The next day, in a lunch with about 15 environmentalists and Republican activists at the Sticky Fingers Ribhouse in Charleston, Inglis got some welcome affirmation. Charleston attorney David Savage told the group he was fed up with his party’s denial of the overwhelming consensus of climate scientists and moves to prop up the failing coal industry, which struck him as a “socialist” solution. The other good news for Inglis and the eco-right was that younger conservatives sounded ready to listen. “I think climate change is an issue that liberals and conservatives are going to be able to come together on. I am really confident of that,” said Jeremy Turner, a Republican and a College of Charleston sophomore, who sported an American flag pin. 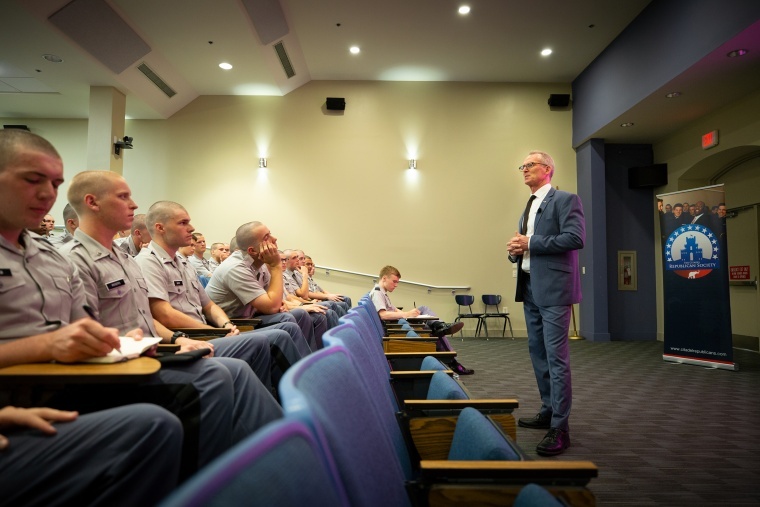 Inglis made his last stop in South Carolina at The Citadel, the bastion of conservatism that only admitted women in 1996, 20 years after the U.S. Military Academy went co-ed.